The Shipwreck beach, also known as “Navagio”, located on the Greek island of Zakynthos in the Ionian sea, ranks first on the “World’s Top 50 Beaches” list for 2018, which was recently released by Canadian travel website FlightNetwork. The list was compiled with the contribution of over 1200 journalists, editors, bloggers and agencies from around the world. As underlined by FlightNetwork, the “diverse list” includes everything, from the astonishing exposed cove of Greece’s Shipwreck beach and the pristine heart of the Great Barrier Reef at Whitehaven Beach, to the karst cliffs and see-through waters of the Philippines’ El Nido beach and the ethereal green beach of Hawaii. 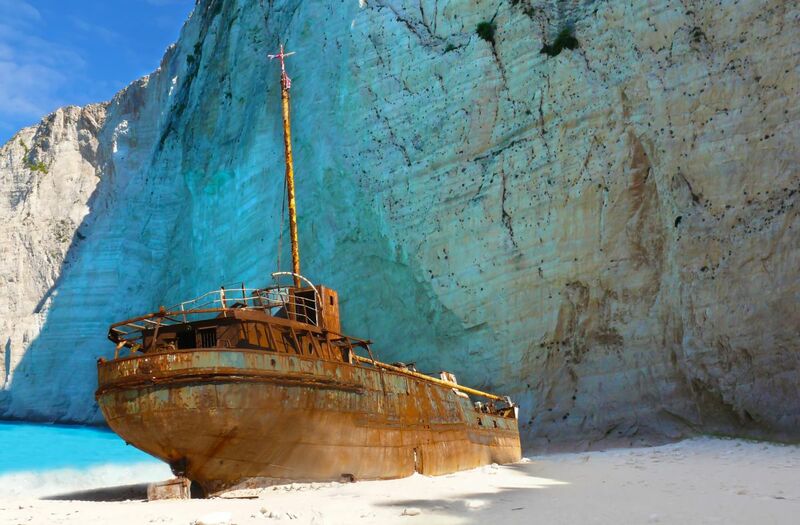 The Shipwreck beach, located on the northwestern part of Zakynthos, is only accessible by boat. “Swimming in these turquoise waters while soaking in the breathtaking surroundings is a memory to cherish for life,” FlightNetwork says. On the shore is the freightliner MV Panagiotis shipwreck, which ran aground in the waters around Zakynthos during stormy weather in 1980, thus the beach today bears the name “Navagio” (shipwreck in Greek). FlightNetwork’s World’s Top Beaches list also includes the Elafonissi beach on Crete, which ranks 56th; the Red Beach on Santorini, which is 77th; and the Loggas beach on Corfu, which in the 92nd position. The “Europe’s Top 50 Beaches” list includes Navagio (1st); Elafonissi (7th); Red Beach (12th); Loggas (14th); Perissa, Santorini (20th); Sarakiniko, Milos (21st); St Paul’s Bay, Rhodes (28th); and Lalaria, Skiathos (31). In addition, the beach of Aghiofarago on the island of Crete, was announced second on the list of the “World’s Top 50 Untouched Beaches”.